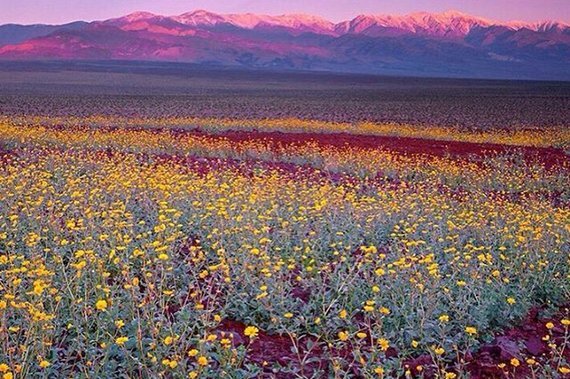 Rarely (every 14 years or so), a super bloom erupts in Death Valley and the desert is briefly (carpeted would be too extreme) finely brushed with fields of purple, yellow, white, and pale pink wildflowers. Thanks to the almost El Niño, we’re having a super bloom this year. And for a brief moment, one of the most desolate places in the world won’t seem quite so desolate. I’ve never been. I’ve always found the descriptions of Death Valley daunting. Death Valley closes in mid-May—it simply gets too hot. It has the highest recorded temperature in the world, 134 degrees; ghost towns on the highway, literal ghost towns without even a ticket-taker or a souvenir shop; an occasional stone house that crumbled on a cliffside with an inexplicable sign that says Historical Monument; and North America’s lowest point, in Badwater Basin’s salt flats. And I’m not sure how I feel about sea level or below sea level when the only sea around is sand. 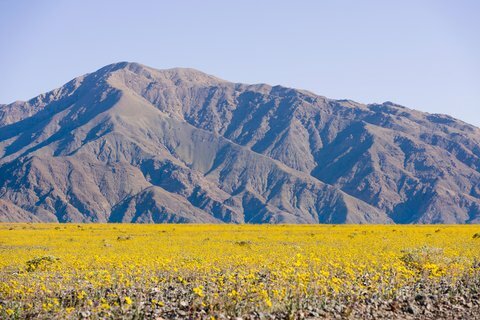 But somehow the idea of the super bloom appealed to me even though I couldn’t get a reservation at the high-end (read: incredibly pricey) Furnace Creek Inn and only one room could be found in the valley at all, at a local motel with a fairly decent (if deceptive) online rating.